Hardwood floors are incredibly customizable: you can choose from a wide variety of wood species, cuts, variations, stains and finishes. Once you know what species you want installed, you get to choose whether you want Prefinished wood or Site-Finished wood. There are perks to both, and knowing which one is best for you can help save time, headaches and money. These floors are easier to install compared to Site-Finished wood floors because they are sanded, stained and finished before they arrive at your home and hence, the installation process will be a cleaner one with comparably less dust, fumes and related project site mess. Since installation is easier, this can be a better choice for existing house renovations, especially because in showrooms you can see what the final look will be with accuracy and know what to expect. It is important to consider that repair can be a little difficult since products and lines can be discontinued and the factory made finish can be difficult to match. 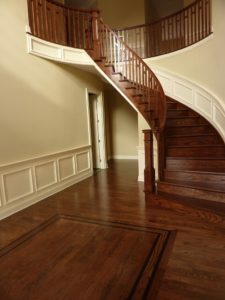 If you are considering customizing floors with inlays, borders and other fancy techniques these might not be the best option for you. If you are considering a more customizable and crafted process, finishing the wood on site is the best option. With this, you can work with your contractor to customize inlays, borders and the color of your floors. The installation process lasts a bit longer than that of prefinished wood, but since the finish is applied on site, the finish coverage on the boards are more abundant (especially on edges). Sometimes during the shipping process the parts can rub against each other and remove some of the finish. This benefits customers who have wood floor in their kitchens as well, as the abundant finish coat protects the wood from the moisture. If you already have hardwood elsewhere in your home, you can simply buy the unfinished wood species and have your contractor match the stain color. Are you curious to see what sample color 1 and 2 would look like combined? Want to test out a couple of stains in your actual floors before making a decision? No problem. Because these floors are unfinished, you can have your contractor customize a blend of colors for you, test out different stains and start from there. The unfinished wood is generally cheaper, but price differences are not significantly greater from one type to another. Prefinished works for those sensitive to fumes, and especially well for those renovating – who appreciate less mess and who aren’t concerned about discontinuing of their choice product. 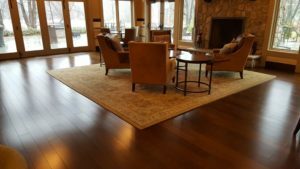 Site-finished is great for those who are looking to match their new installation to existing floors and who would like to experiment and customize their floors. Regardless of the choice, the best decision is one that fits your budget and expectations.